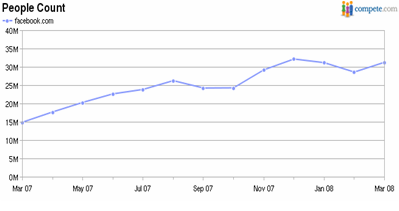 Last week, I posted a stat on Facebook’s February 2008 visitors, which were down from January. The post asked whether it was a trend, or seasonality. Facebook’s March 2008 numbers are in, from compete.com. And they’re up. So it was seasonality. The chart below shows a rebound from February. The same kind of rebound between February and March was seen in 2007. So clearly there’s seasonality to their business. The fatigue felt by prominent bloggers Robert Scoble and Guy Kawasaki is real. But clearly a lot of folks are enjoying Facebook. Perhaps this is the transition of Facebook from early adopters to mainstream. Glad to see the dip was an abnormality. I wonder what was so special about February that it could be called “seasonal”. An initial guess, based on English culture, would be everyone had spent so much money over the Christmas period, that they could not afford nights out, and thus had no half-naked photos to upload for their friends and family members. Great blog, though I would add that maybe Facebook is already mainstream 🙂 Keep it up! Thanks Matt – it is odd the dip in January and February. What’s happening on college campuses then? And you’re right. Facebook is pretty much mainstream. Maybe it’s just losing its early adopters now. Whew! Thanks for this info. I’m glad traffic is back on the uptick. I was starting to worry the bad press would have a negative impact on my “Social Networking Success” webinar (http://www.SocialMediaMoney.com). So far, interest seems very high for it….there are a lot of “mainstream” people who are just discovering the power (and fun) of social networks.